Many years of research and writing have taught me that when people survey a densely packed townscape, often with glassy towers rising above sooty older buildings, they love knowing that this same space of land was once a meadow occupied by cows, or an orchard, or yet the bank of a stream full of fish. What is not always so readily perceived is that, over time, one acre of London soil may have had many different incarnations. Hundreds of years ago, the long stretch of the South Bank, all the way from London Bridge and Borough Market to Lambeth Bridge and the Archbishops’ Palace was a riverbank of bull-rushes and waterbirds’ nests, that had been built up with mud to try to keep the Thames out of the low-lying lands behind. A section at the eastern end had a proper wall constructed earlier than anywhere else along the Thames – the old name Bankside, dating from the thirteenth century, indicates this. Yet attempts to create a permanent causeway to keep the waters at bay were only partially successful and, further west, most of Lambeth remained a marsh into the eighteenth century. Occasional floods invaded buildings all along the riverfront until late-Victorian embankment and drainage got the better of the situation. None of this stopped the citizens of London and its outlying parishes from making the most of their southern shore. 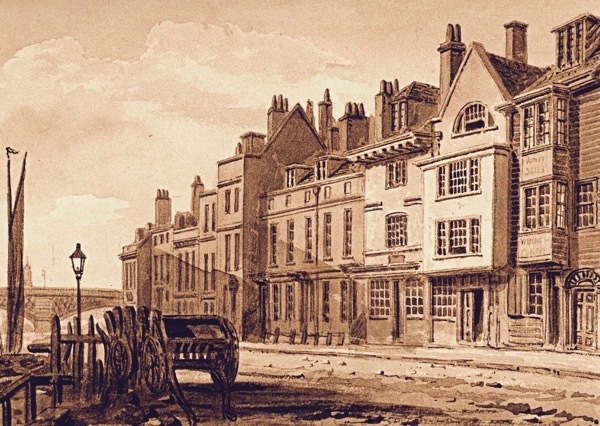 In Elizabeth I’s reign, there was already a row of waterfront inns and places of entertainment stretching as far as where the Oxo tower stands today, just before the river takes a big curve southwards at Waterloo Bridge. 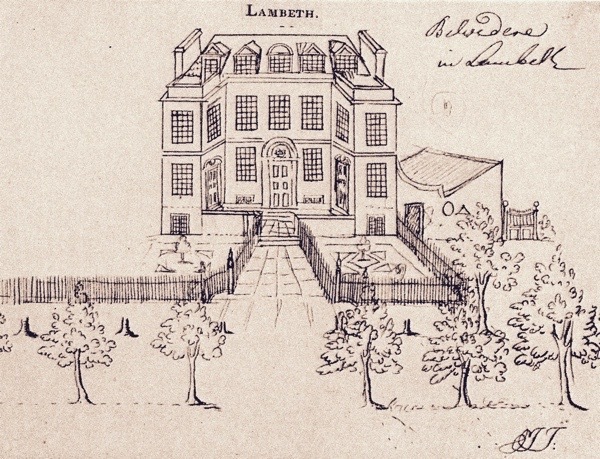 Houses with gardens were built too, favoured by those who wanted to live outside the City jurisdiction, and some of these were given elegant new fronts in the time of Queen Anne. Wharves were already creeping up river from the Pool of London to take over this flowery suburb then. Timber, stone and coal, all heavy loads that could only be carried in any quantity by water in the days of unmade roads, arrived via the Thames estuary and were off-loaded up-river of London Bridge. At the beginning of the nineteenth century, when the Industrial Revolution was sweeping through England and sending more and more of its products to London, the river front all the way to Lambeth was effectively privatised, partitioned among wharf-owners, importers and traders. 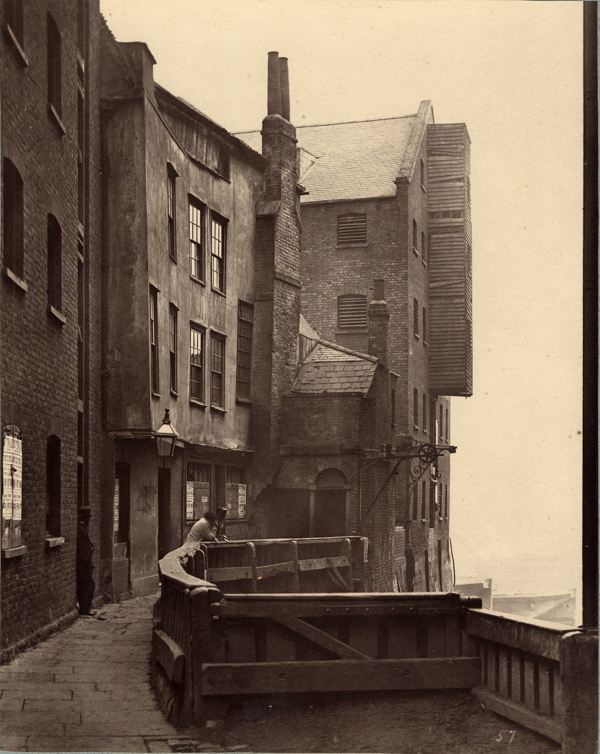 By the twentieth century, there were over fifty privately owned wharves between London and Lambeth Bridges, many of them occupying one-time gardens. The wharf buildings that hemmed in these elegant houses for two hundred years have gone now too as if they had never been. Fortunately, the desert of concrete blocks with a road in front that the planners envisaged for this stretch of the river did not get built. Instead, the idea of a public walkway to join up with Lambeth, where the Festival of Britain was held in 1951, gained more and more support. Yet the public were slow to realise what a wonderful present they had been given in a promenade with unimpeded river views that had been denied to their ancestors for centuries. Even twenty years ago, when the walkway had been completed – but had not yet been discovered by the café-owners, strollers, foreign tourists, exhibition-viewers, skate-boarders, performers and all the others who now throng it – I used to walk there alone and wonder why more did not know of it. Beware what you wish for! On the one-time site of the Festival of Britain, the transformation over the decades has been even greater. I am one of that diminishing generation who remember visiting the Festival in childhood. In what was still the period of post-war austerity and rationing, it seemed to me be a fairy-tale of colour, lights, and a promise of a new time to come – especially when I was taken to a restaurant overlooking the river and saw people dancing at night in an open square. Goodness how foreign and exciting! In reality, the Festival had been a contentious venture, crammed between Waterloo Bridge, Waterloo Station and Blackfriars Rd, with the railway line from Hungerford Bridge crossing over it. The whole site was summarily cleared in order to build transient exhibition pavilions, the Dome of Discovery and one permanent structure – the Festival Hall. 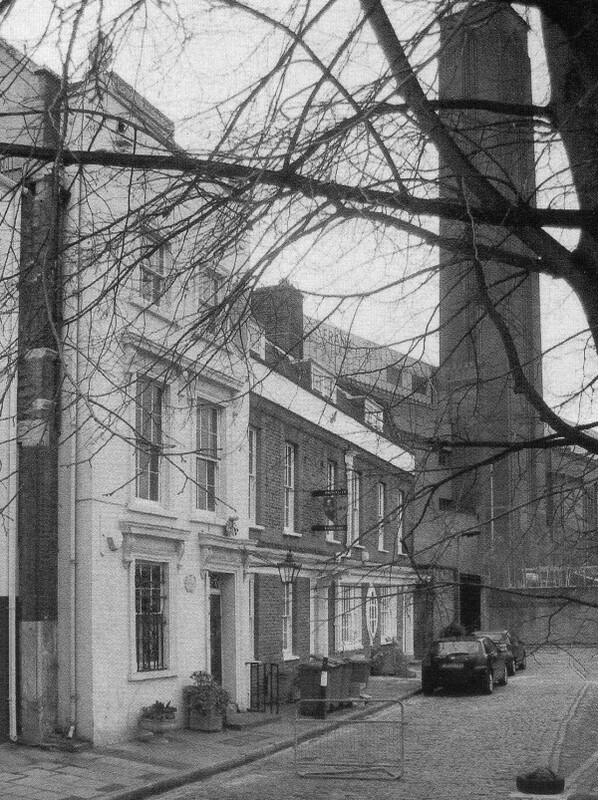 The only old building that was not swept away was the Shot Tower, an elegantly tapering tall brick chimney built for dropping globules of lead down into cold water. Disused, it was done up for the Festival with glass bubbles at its top. I loved it for its mysteriousness and was very sorry – as were many people – when it was destroyed the following year in the interests of modernity. It stood next to the Festival Hall, in the space now occupied by the unsatisfactory Queen Elizabeth Hall and Hayward Gallery. A tree is said to have been planted in its memory, but I have never been able to find it. The road that runs past this line of buildings and under Hungerford Bridge, with the late-fifties Shell Centre a little further along on the other side, is still called ‘Belvedere Rd,’ a name that dates from long before the area’s wharf-and-industry time. 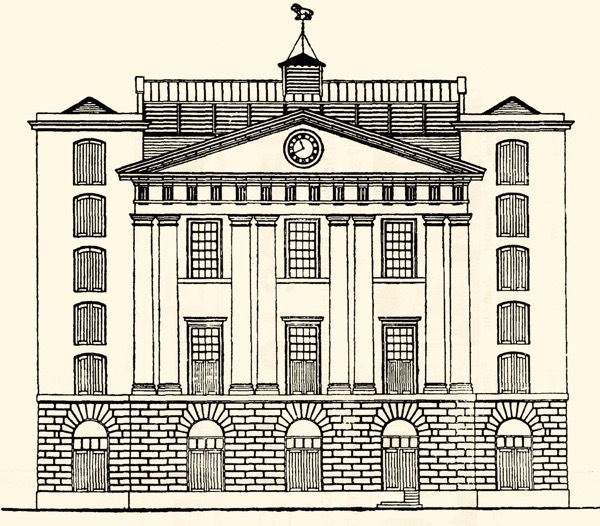 It was christened in the eighteenth century after a gentleman’s house called the ‘Belvedere’ standing by the river in its own garden. Nearby there was also `Cuper’s Garden,’ dating from the previous century, which by-and-by was opened to the public and, acquiring a raffish reputation, became known as `Cupid’s Gardens.’ Similarly, there was a `Temple of Flora’ and `Apollo Gardens.’ Evidently, Greek names were felt to bestow a picturesque quality on places of dubious encounter. All the sinful, pretty gardens had disappeared by the mid-Victorian era. 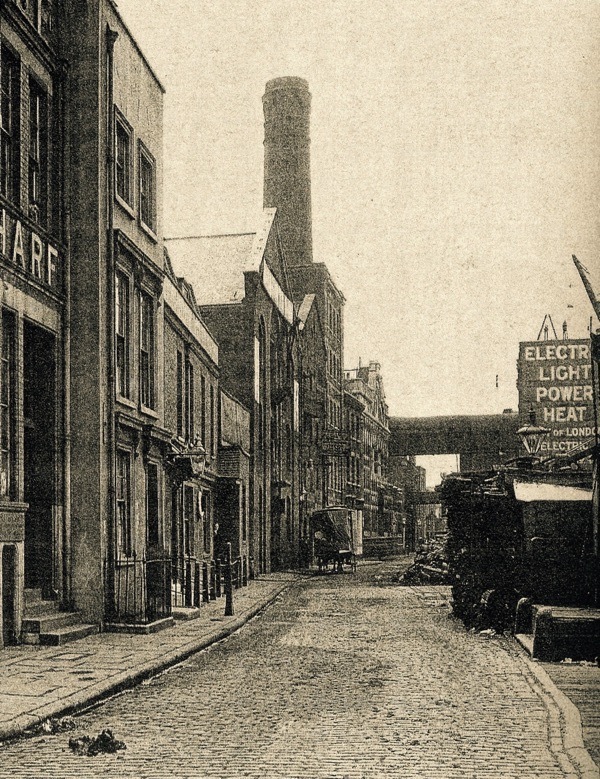 Waterloo Bridge Rd obliterated Cuper’s, which became a wine depot and then a vinegar works before in was obliterated. 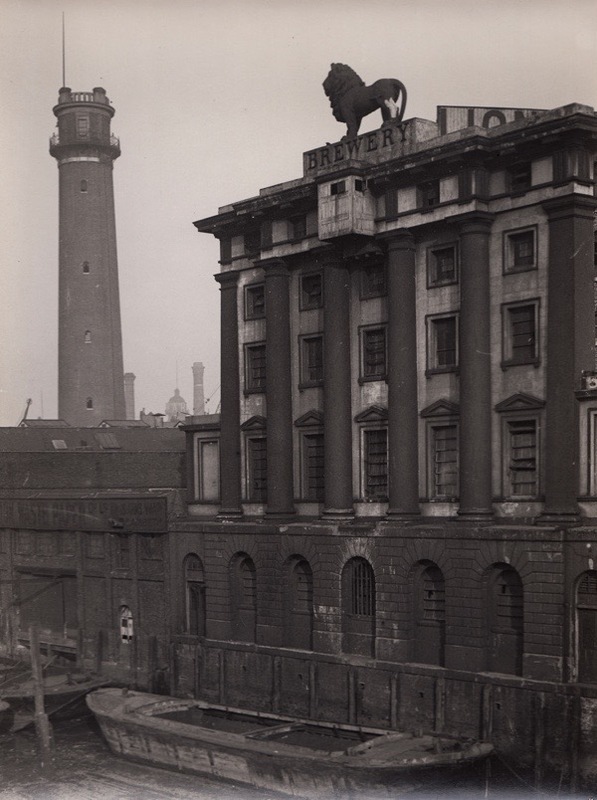 On the site of Belvedere House, the huge, rather elegant Lion Brewery rose, with a locally manufactured Coade Stone lion decorating the top of its classical façade. The brewery survived till the Festival swept it away to build the Festival Hall. Yet a few other time-tested buildings lasted till after the war. Numbers 55 and 59 Belvedere Rd had elegant porches and wrought iron gates that survived even after their one-time gardens had disappeared under wharfs and storage sheds. I feel an curious personal link to No 59, since it became the fictional location for a set of characters derived from my Anglo-Irish ancestry. In 1946, my father’s sister, Monica Tindall, published her only novel, The Late Mrs Prioleau, which was based on the last two generations of our shared relatives. 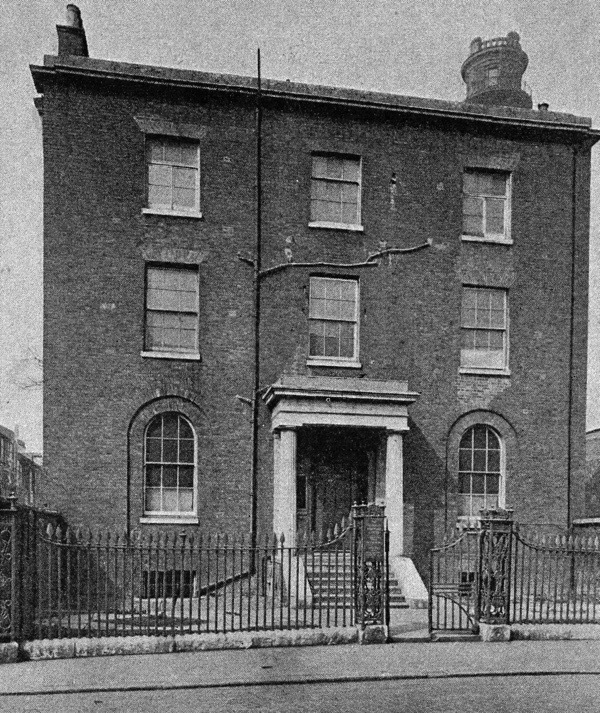 Although the plot, revolving around an ill-omened marriage in 1900, was invented, Monica placed this unhappy couple in 59 Belvedere Rd which she had visited during the Second World War when it was a hostel for women war-workers. Buildings which furnish the settings of entire lives can vanish so completely, along with all their memories, that it is cheering when one finds an afterlife in a book, however obscure. Bricks and concrete are destroyed as if they had never been but sometimes literature lasts longer. Even if the old South Bank of marshes, of pleasure gardens, of gentleman’s houses, of breweries and of lead-works, is utterly gone, The Late Mrs Prioleau was reissued by Dean Street Press earlier this year. 1900 map of the area that later became the Festival of Britain. 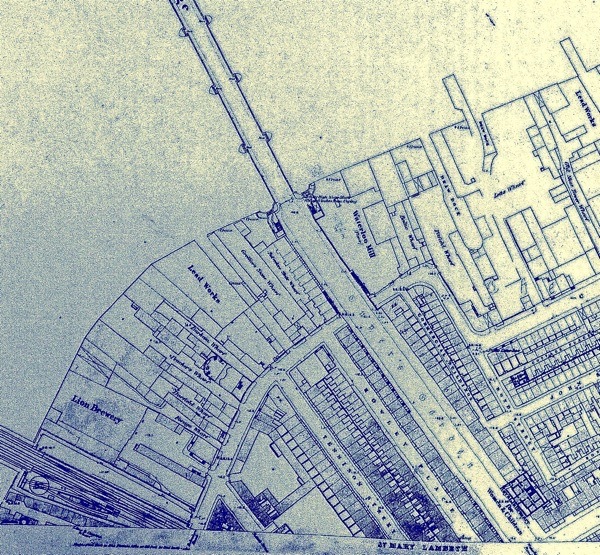 The half-moon shape of the back of 59 Belvedere Rd, with the house in front and assorted sheds behind, is visible half way between Waterloo Bridge Road and Hungerford railway bridge, mid-way between the Lead Works and the Lion Brewery. Another post to make one weep for what’s gone! I recall many walks between Waterloo and London Bridges in the late ’80s – often I didn’t see another person for half an hour at a time. Now, the experience is akin to being an extra in a Cecil B DeMille epic. A new Gillian Tindall book! I too used to walk along the empty path along the river back in the late 70s and early 80s and wonder where people were. Thanks for this trip along the riverside. I dearly love The House by the Thames ( I have re-read it at least three times !) and very much look forward to reading your new work. 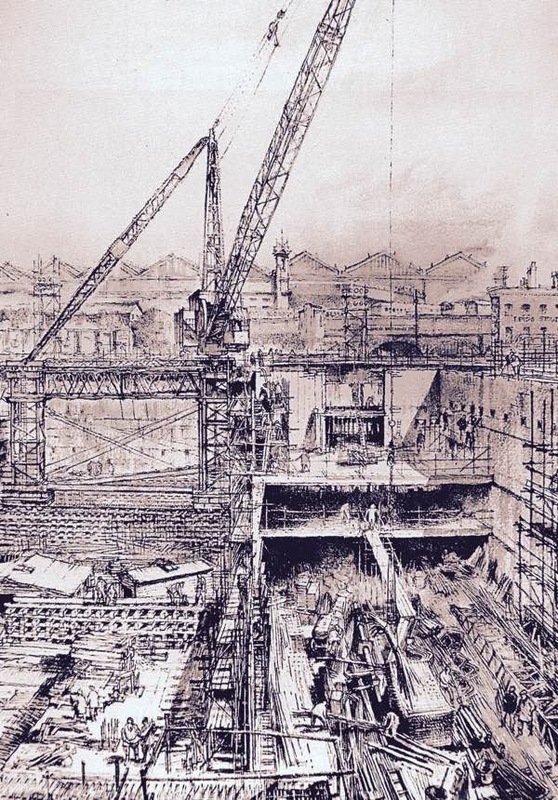 GA, thanks for sharing Gillian Tindall’s great piece on South Bank and its development over time. Recently I have written many articles about Lynnfield MA (just outside of Boston) and agree that folks “love knowing that this same space of land was once a meadow occupied by cows, or an orchard, or yet the bank of a stream full of fish.” People enjoy knowing the names of the farms on which their subdivisions now sit. No doubt, the development of South Bank has been a great success. Not to be outdone, the last time I was in London a young man was passing out flyers touting the similar charms of “North Bank” near Aldwych and LSE. I guess these merchants look across the River with envy. I also enjoyed a visit to Docklands Museum which preserves so much of the River’s history. Despite living up here in the Black Country, I have long been a reader of your books.